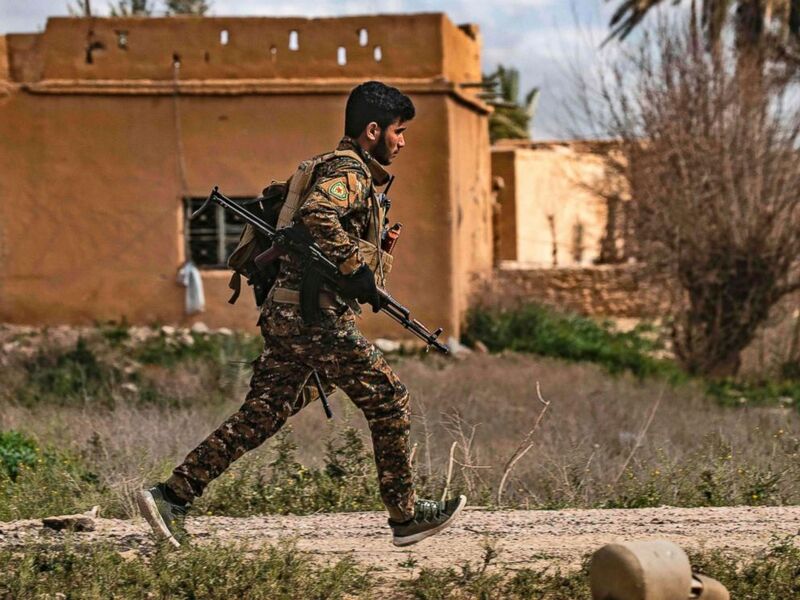 "Syrian Democratic Forces declare total elimination of so-called caliphate and %100 territorial defeat of ISIS," Mustafa Bali, head of the SDF press office, said on Twitter. "On this unique day, we commemorate thousands of martyrs whose efforts made the victory possible." 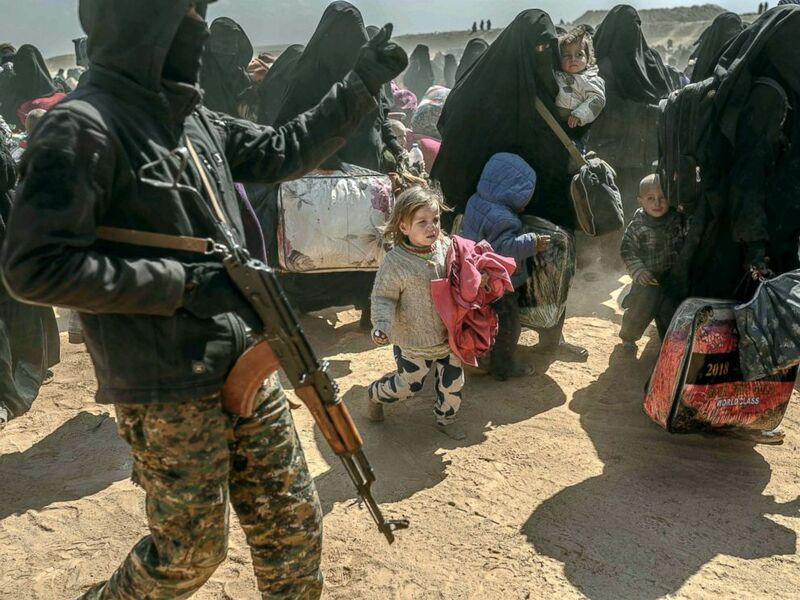 Women and children, evacuated from the Islamic State group's embattled holdout of Baghouz, arrive at a screening area held by the US-backed Kurdish-led Syrian Democratic Forces in Deir Ezzor, Syria, March 6, 2019. The first U.S. troops -- just 50 advisers -- arrived in Syria under the Obama administration in October 2015. That number has grown to about 3,000 as the U.S. prepares to withdraw most of those forces under orders by President Donald Trump. Trump had touted in recent days that ISIS was on its last legs. He proudly displayed a once-classified map showing how the forces had waned since his election two years ago on both Thursday and Friday. His declaration on Thursday that ISIS would be "gone by tonight" was the third time he'd declared victory in three months. 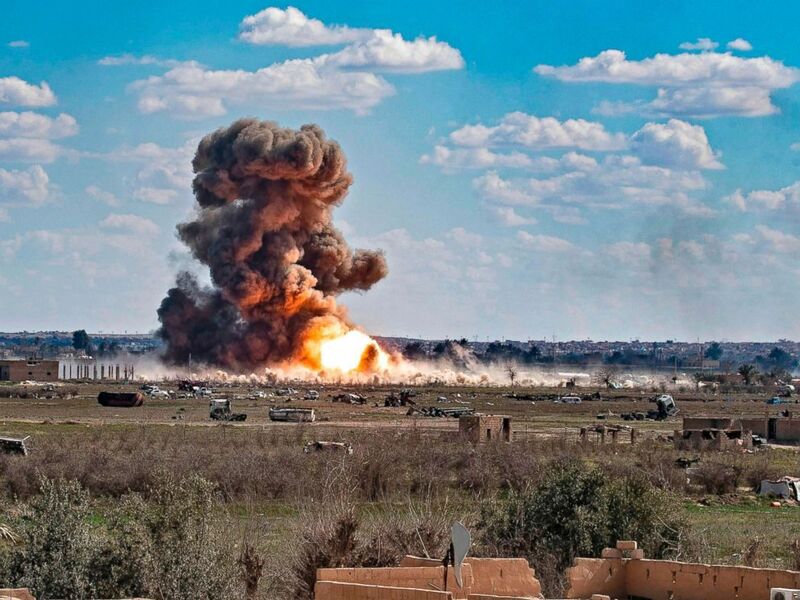 Smoke and fire billow after shelling on the Islamic State group's last holdout of Baghouz, in the eastern Syrian Deir Ezzor province, March 3, 2019. The commander of U.S. troops in the Middle East Gen. Joseph Votel warned March 7 against the "calculated" retreat of ISIS fighters from Baghouz, saying the exodus of thousands is not a surrender, but a decision to retreat to camps and remote areas in the region until they can reconstitute as a violent extremist organization once again. "In my view, this is a serious generational problem that if not handled properly will sow the seeds of future violent extremism,” Votel said.